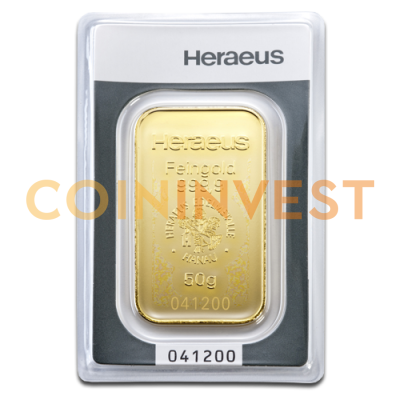 Heraeus is a long-established German refiner and supplier of precious metals with roots dating back to 1851. The 50 g gold bar is an excellent way to give your portfolio a boost and is also the ideal solution for those looking for a safe haven for excess capital. Each bar of .9999 pure 24 carat gold is supplied securely sealed in an assay blister pack that displays its unique serial number. 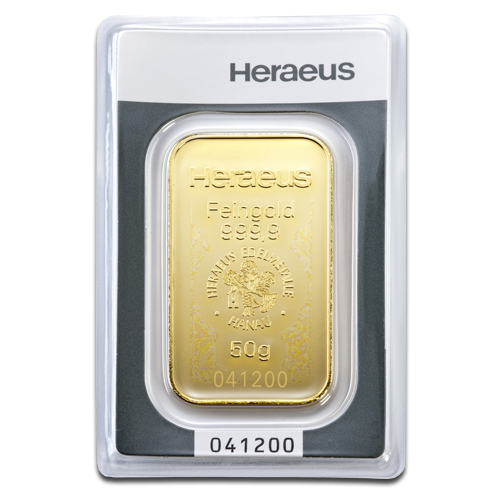 50 g bars bear the company's crest and show the gold's weight and purity and since Heraeus bars are approved by the London Bullion Market Association they are easy to trade. CoinInvest.com is able to offer its customer this fine 50 g bar at the lowest possible price thanks to our ability to buy gold in larger quantities from some of the world's leading producers. We endeavour to ship all orders as quickly as possible and continually strive to find the best investment opportunities for our customers. Very impressed with everything so far and will use again.